NOTE: All furnishings and interior designs were temporarily set up for the Women’s Association of Morristown Medical Center foundation. Only specific light fixtures, pieces, and wall coverings are original to the house. All fireplaces, doors, and moldings are original. Only certain floors are original or restored. 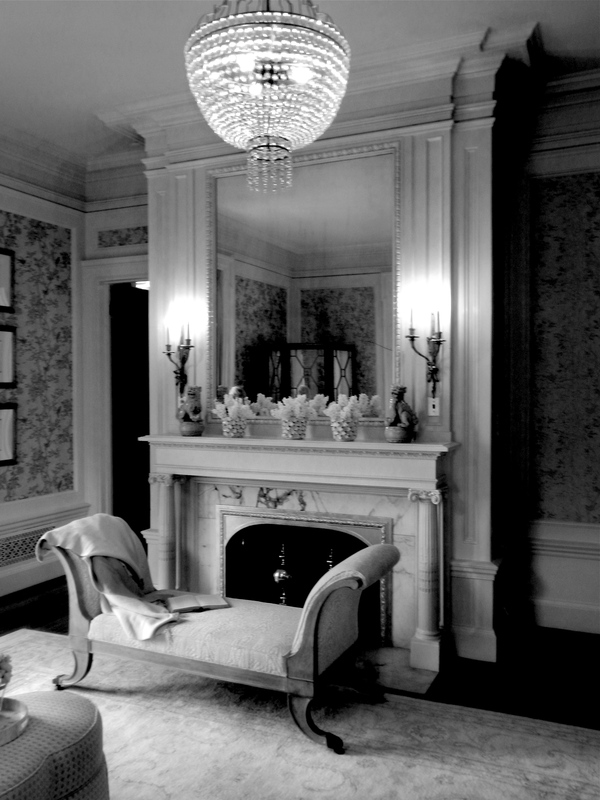 A designer was selected for each space to create an atmosphere, either new or reminiscent of the era. The owner reserves the right to keep the room as is, or change it as he moves forward with the restoration of Blairsden Mansion. 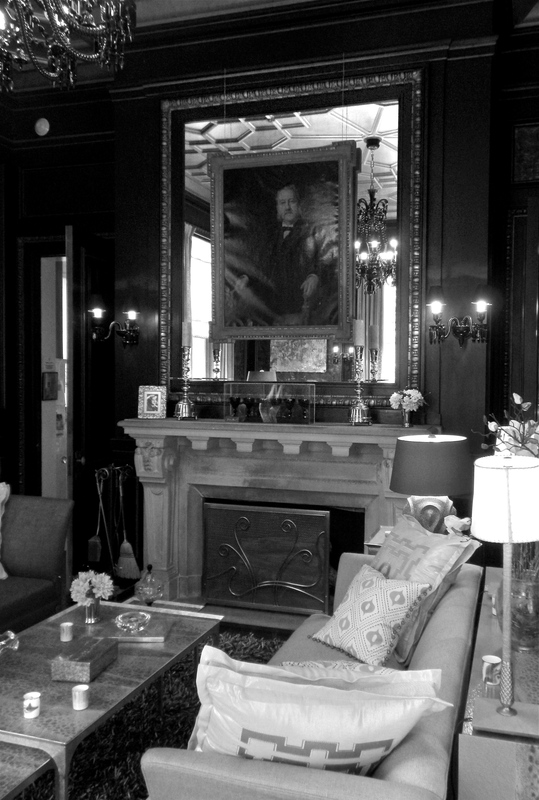 Long before the first brick of the Blairsden Mansion was laid upon the foundation of the opulent, Gilded Age estate, there was a man by the name of John Insley Blair. In 1802, Blair was born in Belvidere, New Jersey of John Blair and Rachel Insley. In total, the Blair’s birthed ten children. Angled down from one of two swooping stairwells from second floor down to main level. In his youth, Blair helped with his family’s local store. As he entered adulthood, the future business prodigy opened the doors of his very own store at a ripe age of 18. Less than a decade after turning the key for the first time, John Inlsey expanded his efforts to four additional locations. With his businesses thriving, he acquired four flourmills and soon after, a wife. Nancy Ann Locke and John Insley Blair were wed on September 20, 1828, and later had four children. Soon, the proud parents and their kids, Emma Elizabeth, Marcus Laurence, DeWitt Clinton, and Aurelia Ann would propel in to one of America’s wealthiest families. 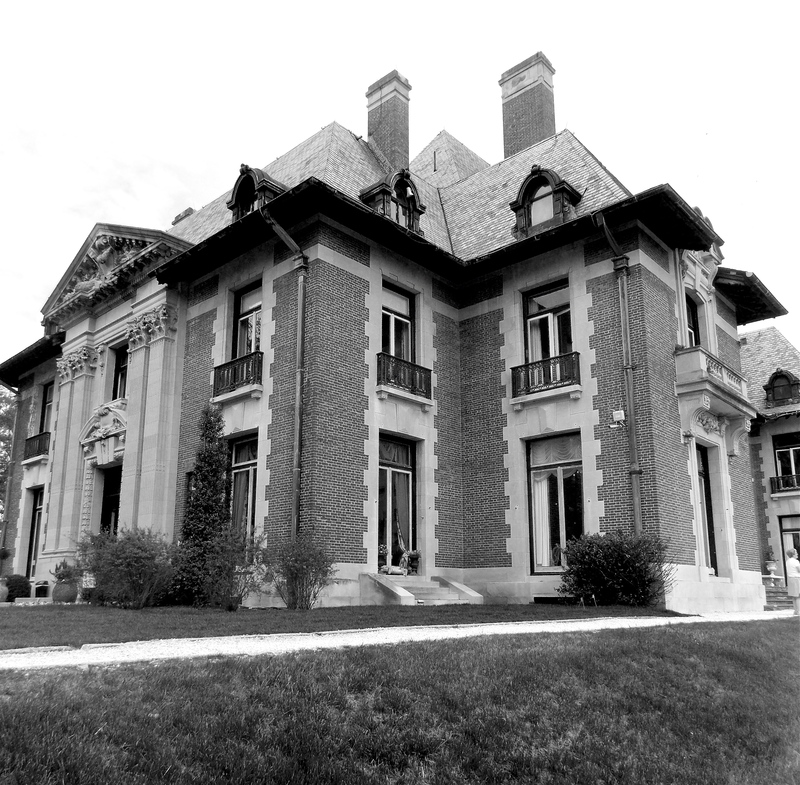 South Facade of Blairsden Mansion. Stairs on right lead to lower level terrace . With a blossoming mind dictating eager pursuits, Blair developed an interest in coal and by 1946, played a vital role in the creation of Lackawanna Coal and Iron Company. This was just the start for the aspiring developer who was just scraping the iceberg of what would make him millions. Just like his friends, the Vanderbilt family, Blair entered mega wealth with the construction of his first railway in 1849. The Union Pacific Railroad was developed a few years later under Blair’s ownership in conjunction with Oakes Ames. Now on Blair’s spread of achievements were the 16 railroads he reigned over, as well as being the biggest private owner of rail miles in the world. While most of Blair’s attention was on business and expansion, his heart was on charity. It is estimated that John Insley Blair donated over $5 million to various charities, institutions, and churches. His main interest was the creation of the Blair Presbyterian Academy in Blairstown. Religion played a vital role in his life. As well as BPA, Blair, an alumnus of Princeton University, donated to the Ivy League school by building Blair Hall. He served as a trustee from 1886-1899. DeWitt Clinton, son of John Insley Blair, followed in his father’s footsteps and attended Princeton University. He added to Blair Hall and continued to build up Blair Presbyterian Academy. He was the last of the Blair’s to serve as a trustee at Princeton University. After marrying Mary Ann Kimball in 1864, Blair became the father of two boys, James Inlsey and the future owner of Blairsden Mansion, Clinton Ledyard Blair. as trustee at the university. The reason? A major dispute erupted over reforms that were put in place by then governor of New Jersey, Woodrow Wilson. This generated distaste for Wilson, which carried out to his campaign for presidency. Does Woodrow Wilson sound familiar? A previous Estate on this site, the original Shadow Lawn Mansion, was the rented summer cottage for Wilson during his campaign in 1912. Some of Blair’s many accolades include: co-founding the investment firm Blair and Company, serving as director of Lackawanna Steel, the Green Bay and Western Railroad, governor of the New York Stock Exchange, and many other investments and pursuits. Grand Dining Room facing private garden. Along with his wife Florence Osborne Jennings, Blair welcomed four additions to his resume. Marie Louise, Edith Dodd, Marjory Bruce, and Florence Ledyard were Clinton Ledyard’s four attempts at carrying the Blair name. Though none were male, they would soon become the princesses of one of America’s most treasured homes upon its completion in 1903. 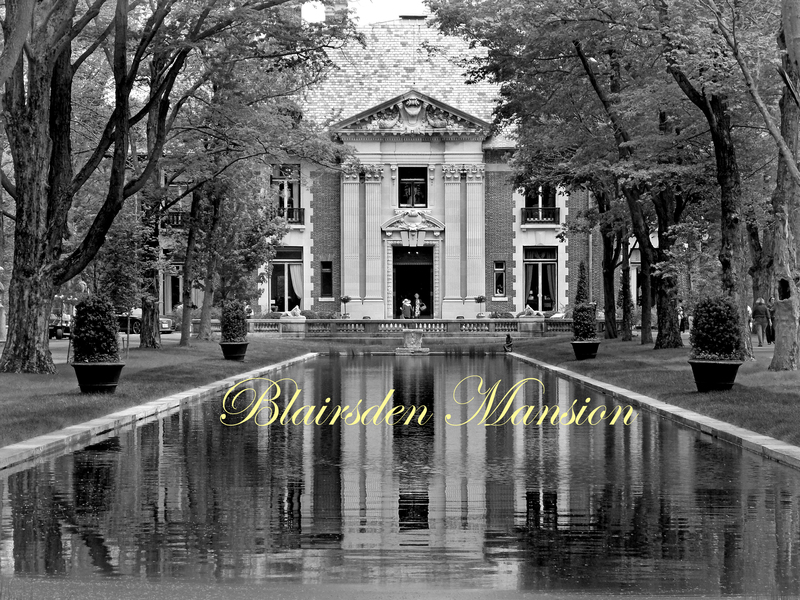 In 1898, two years before grandfather John Insley’s death and the passing of his $75 million fortune, Clinton Ledyard’s construction of Blairsden Mansion began. 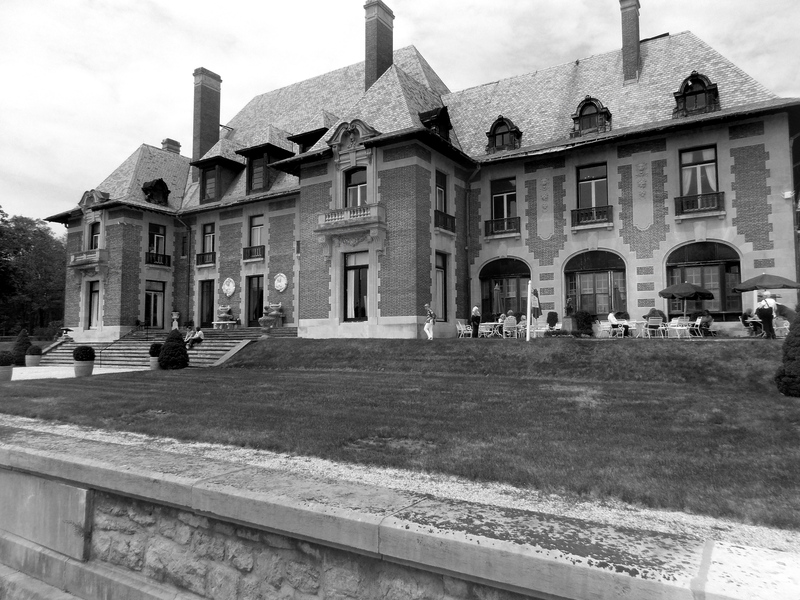 The 56,000 square foot mega mansion took five years to finish and was completed in 1903. The 31 bedroom estate still stands today on the top of a hill overlooking Ravine Lake in Peapack-Gladstone, New Jersey. One of many living areas on the first floor. Serving as C.L. Blair’s weekend home, Blairsden was constructed with pure opulence sparing nothing in completing the magnificent jewel in the very affluent Somerset Hills region. In 1903, the Louis XIII styled palace cost $2 million to build. In today’s currency, that is roughly $51million. Originally, Blairsden had an entrance on Lake Road in Bernardsville , New Jersey. The driveway entered upon a densely wooded road and took you over the dam Blair built in order to block the North Branch Raritan River to create what is now known as Ravine Lake. Stone staircase leading to original driveway and Ravine Lake. Once you passed over the dam, A large gate welcomed you to a long shaded driveway that trailed along the perimeter of the elbow shaped lake up around the back of the hillside to the reflection pond. 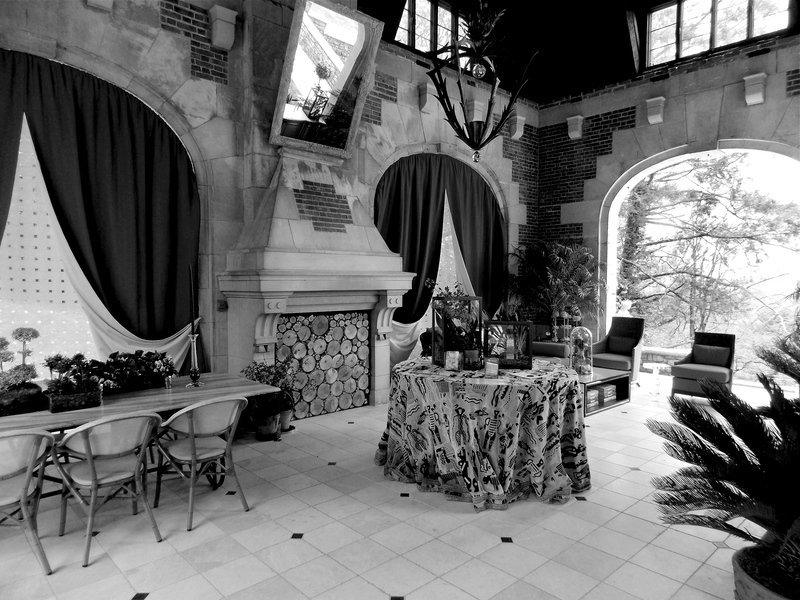 Later, Blair constructed a second entrance in the center of Peapack-Gladstone with a massive gate and courtyard adorned with fountains and elaborate walls. This driveway is one full mile from the gate to the entrance of the 534-acre home. Both driveways met at the 300-foot reflection pond leading to the bronze front doors. But before reaching the doors, guests were greeted by the resident swans Elsa and Lohengrin. 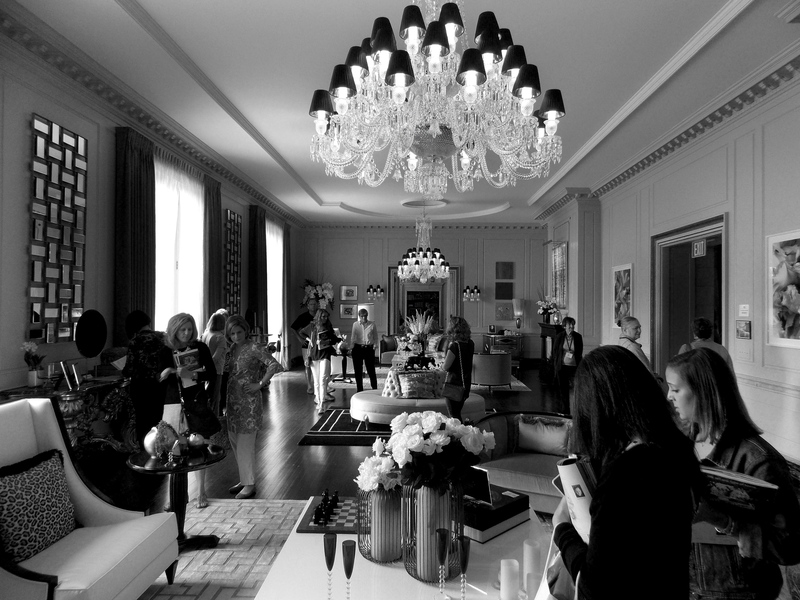 Before entering the home, guests could visit the flower gardens that boasted over 1,400 species of roses. The estate housed tennis courts, lodges, carriage houses, and many horse trails. The most famous façade of the house overlooks the rolling hills of Somerset County. 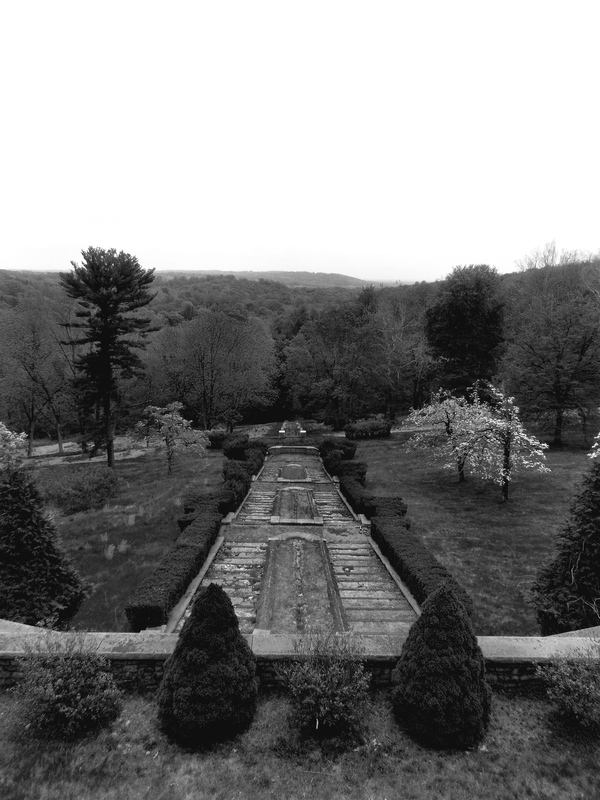 It is rumored that Blair built on that specific hill in order to see His beloved Princeton from his living room. 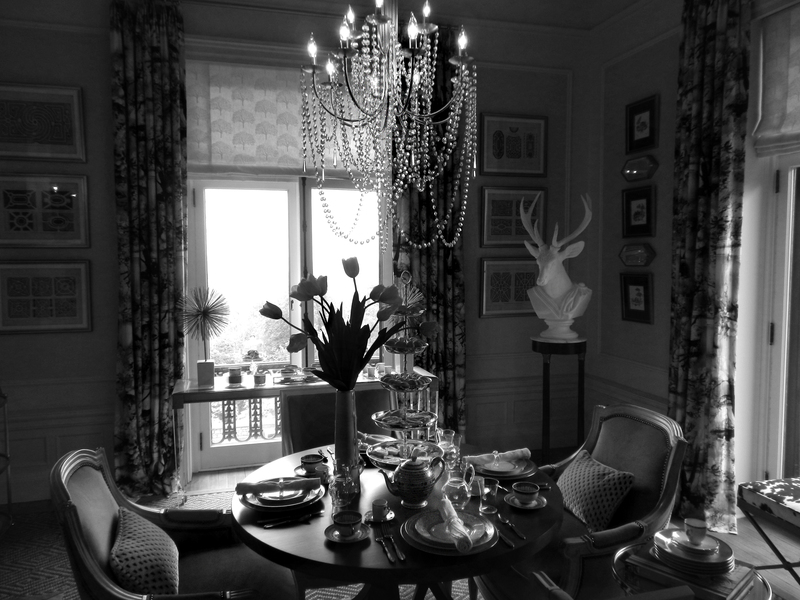 Bedroom at Blairsden transitioned in to a Tea Room for Mansion in May. When standing in the courtyard just outside the first floor, it seems that one is standing on a flat piece of land, but in actuality, the basement level is just below housing the Turkish baths and indoor squash court, among other expensive features. Proceeding down the hill from the basement level terrace lined with beautiful arched windows, the remnants of the stately stone and brick stairwell descend to the original driveway and lake below. Sitting Room at the end of first floor hall. Entering the front doors of Blairsden is like taking a step back in time. The walls in the main hall appear to be stone with marble entries to various rooms. The view from the front door takes you almost the full length of the house to a mirroring sitting room resting just outside the library, formal dining room, and kitchen. 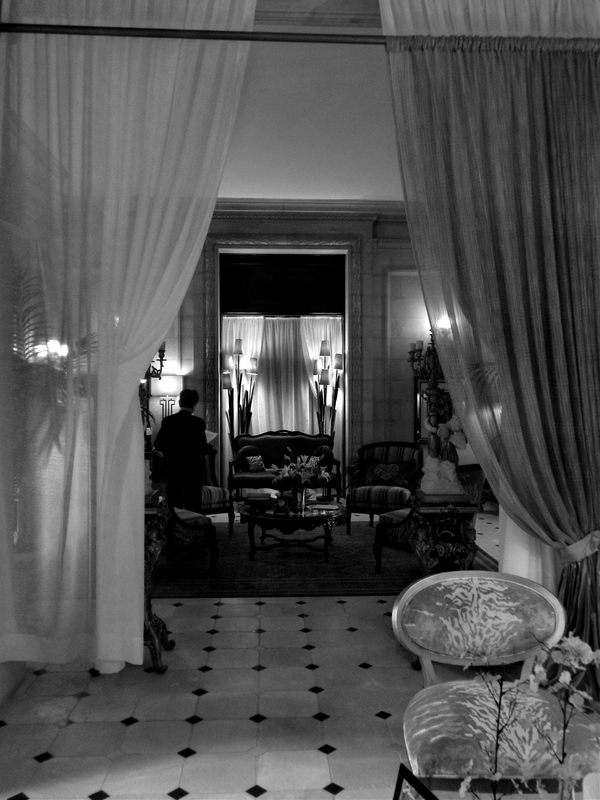 Next to the entrance is a small reflection room that was used by Blair’s wife. The view from one window features the rolling hills off the side of the cliff, and the other offers a calming scene of the reflection pool. The hall leading to the room features an original call box with the labels used to name each room, including Mr. Blair. Men’s Lounge/ Billiard Room at Blairsden Mansion featuring original leather walls. 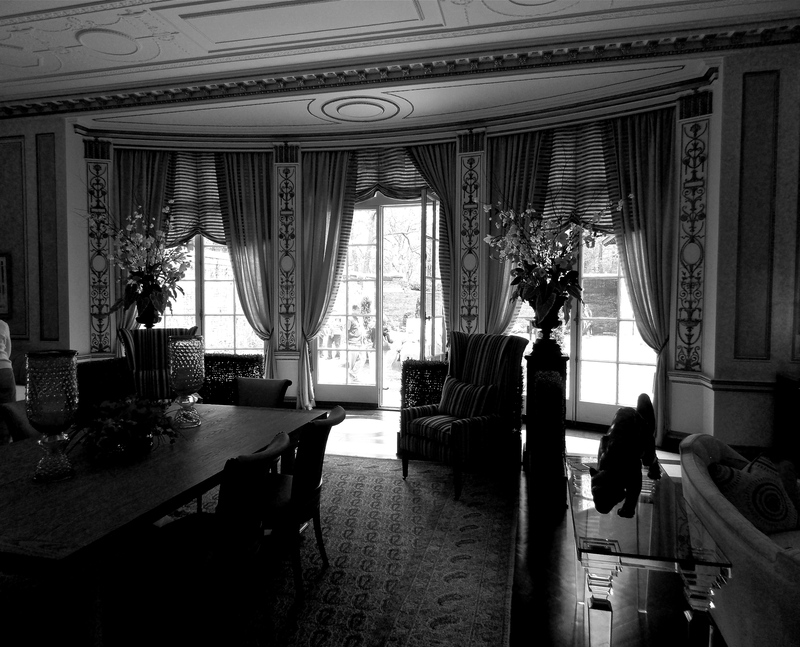 On the main floor there are about 10 large rooms boasting extravagant views. 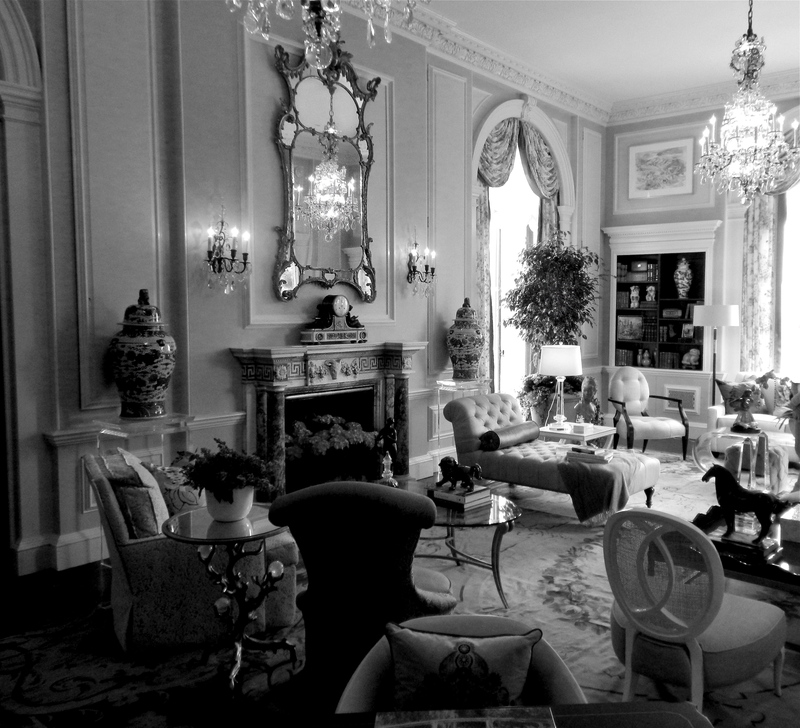 A large living room, masculine billiard room, and reflection room find solitude in the western side of the main level. The center of the home features a grand entertainment room with three sets of doors leading out to the courtyard terrace that overlooks the Somerset Hills. Behind this room there is an entrance back to the center hall and striking stairwell that take you up to a main platform, then spirals in two directions to the second floor hall. The eastern end of the main floor features a sitting room, formal library drawing room, newly added kitchen, remnants of the former servants kitchen, and a palace style dining room with glass doors leading to a private garden. Beyond that garden is an outdoor, pillar-lined walkway leading to an outdoor living room with a spectacular fireplace and view. Blairsden features 25 unique fireplaces. Outdoor Living Room on East side of Estate overlooking the Somerset Hills. Thirty-one bedrooms adorn the upper levels of the home. Among them are Mr. Blair’s bedroom facing the rolling hills, and Mrs. Blair’s bedroom facing the back of Ravine Lake. 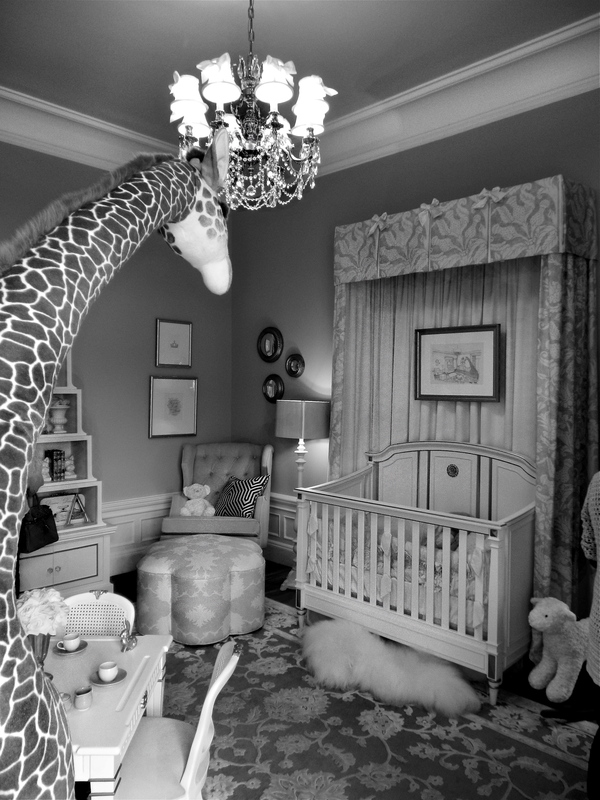 Clinton Ledyard Blair’s Master Bedroom. At the end of the hallway, just outside the master suite, a large atrium room sits with a fireplace and fogged glass ceiling to allow natural light in to the large upper level. Just behind this room were the two bedrooms originally used for the two governesses. A large metal stairwell spirals just outside those bedrooms from the uppermost level in the roofline down to the basement for the 34 member staff to navigate the home. Staircase from second floor to the formal end of third floor. 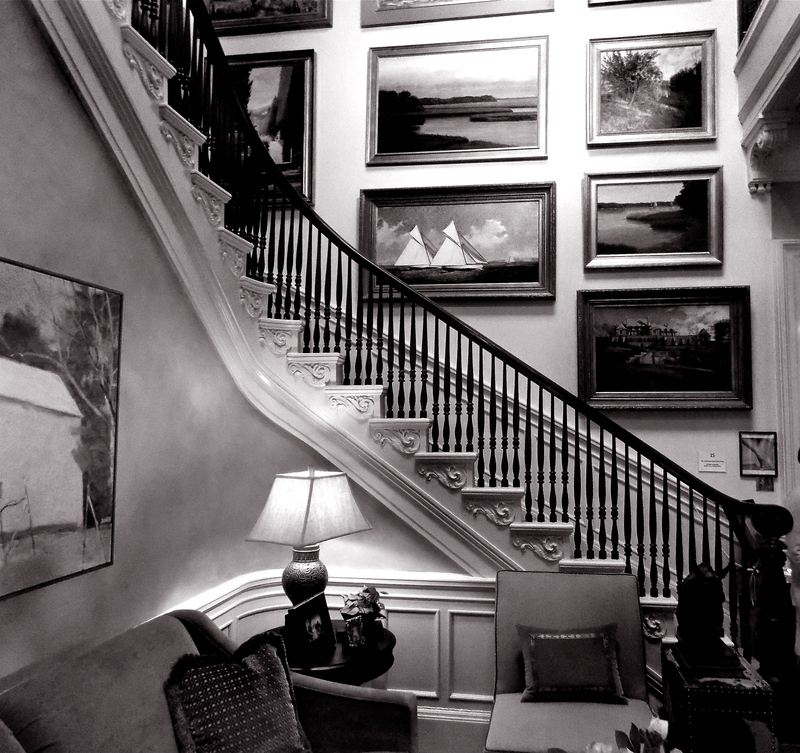 Once back in the main hall of the second level, the eastern end showcases a small family room area accompanied by a large, formal stairwell that took guests to the formal section of the third floor bedrooms. Clinton Ledyard Blair passed away in 1949 at the age of 82. While his four daughters inherited the estate, the land was soon broken off in to small portions and sold off until the home was ultimately sold to The Sisters of St. John The Baptist for $60,000 in 1950. Unfortunately, the home went for a long span of time with minimal maintenance causing the interiors to crumble and the exterior to face extended harsh conditions without proper upkeep. 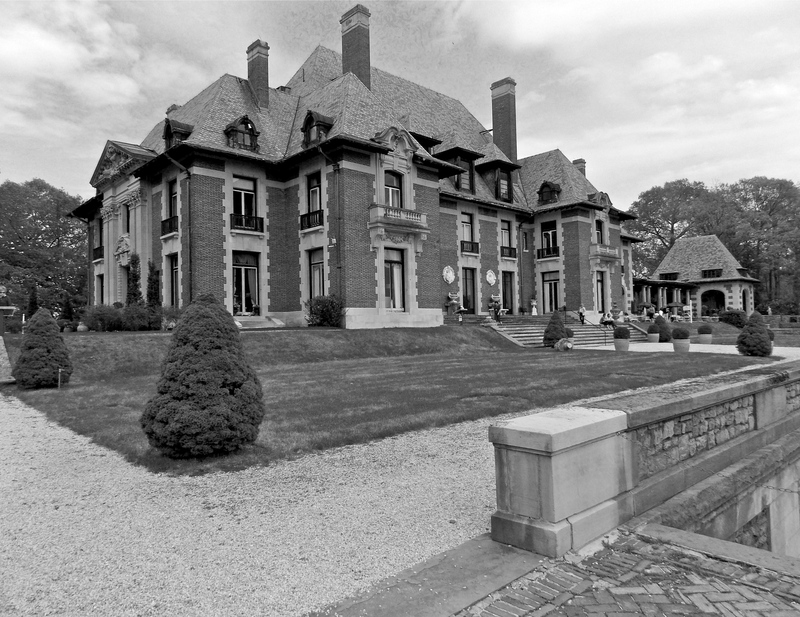 In 2012, a man wanting to remain anonymous purchased Blairsden Mansion. Though his name is known, I choose to respect the wishes of the owner and not publish it on this site. It is reported that the house was purchased for $4.5 million and has taken over $14 million just to restore the first two levels. Though the exterior looks great, the roof needs to be replaced as well as the eves. 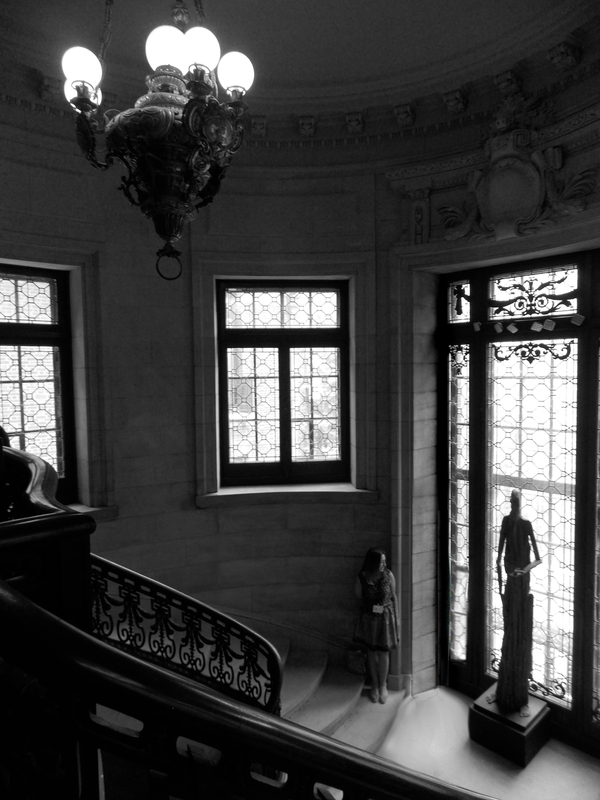 Many exterior walls show the weathering of the past century and the grand, stone stairwell to the lake is in disarray. What can be said about the current owner is that he is a developer who loves historic estates. 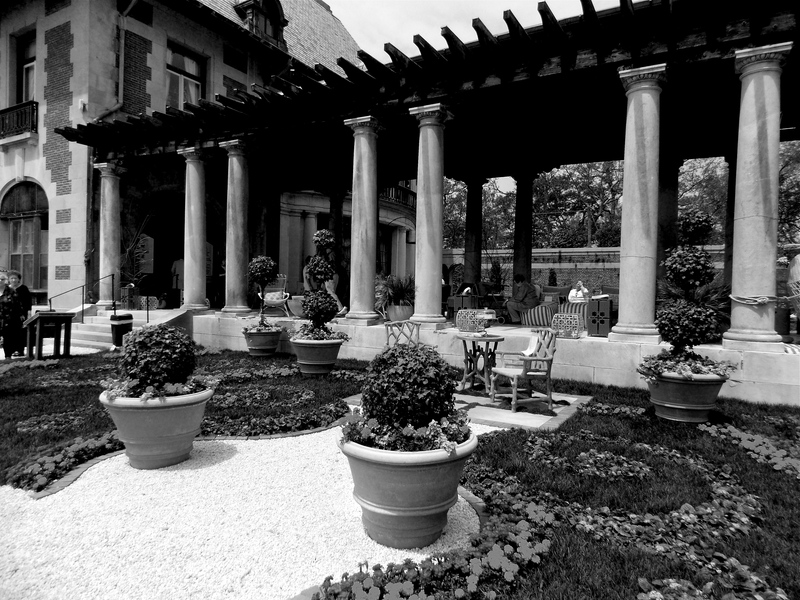 The mission is to completely restore the Blairsden Mansion to its original grandeur and be used as a weekend home in the hills of rural, northern New Jersey. In a sense, the 1903 Estate is being reborn over a century after its original construction. By the time the current project is completed, expect to see Blairsden Mansion reemerge as one of America’s priciest homes. Pillar-Lined Walkway from main house to outdoor living room. Information learned over years of research, tour, and visits to area. Blair Historic Preservation Alliance — John I. Blair.” Blair Historic Preservation Alliance — John I. Blair. The Trustees of Princeton University, 2011. Web. 30 May 2014. The History of Blairsden in Peapack, NJ – Historical Society of The Somerset Hills.” The History of Blairsden in Peapack, NJ – Historical Society of The Somerset Hills. N.p., n.d. Web. 30 May 2014.